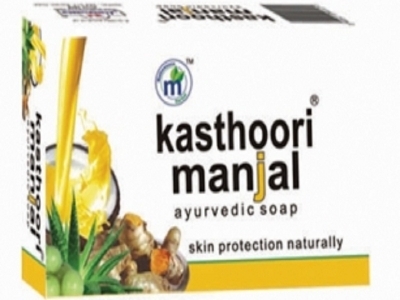 Kasthoorimanjal Ayurvedic Soap, made out of natural herbs like Amla(Phyllanthhus embica), Wild Turmeric (Curcuma aromatica), Aloe Vera (Aloe vera doun), Turmeric (Curcuma longa), Coconut Oil(Cocos nucifera) improves complexion and protects your skin naturally. The soap is an effective remedy for pimples and acne.The enriched yellowish turmeric colour and the formation of ayurvedic herbs make Kasthoorimanjal a unique Ayurvedic Soap. It's a 75 gm Soap with 72% TFM.